What’s in a name? A rose by any other name would smell as sweet, right? But, sometimes, what certain things, situations, or ailments are called can lead to confusion. I recently heard of someone naming their pet cat, “Dog.” Funny, but confusing. The word arthritis (literally meaning, “joint inflammation) conjures up images of knuckle-cracking, and little silver-haired ladies using a walker and moaning about the rain. It does not connote the debilitating and serious inflammatory autoimmune condition that is, “rheumatoid arthritis” and which affects people of all race, color, and creed. This terminology – and the stereotypes surrounding the word “arthritis” – are part of the problem with spreading awareness about this disease. The fact that there are 117+ different types of rheumatic and arthritis-related diseases that are sometimes referred to under the blanket term of “arthritis” makes it even harder. So what IS arthritis? As we stated, it is inflammation of the joint, often associated with joint pain. Joint pain in and of itself is not a disease, it is a symptom of a disease – and a symptom of a lot of diseases ranging from, yes, classic osteoarthritis to Lupus, Sjogren’s syndrome, Celiac disease, Fibromyalgia, Multiple Sclerosis, Scleroderma, Myositis, and even some kinds of cancer. Joint pain can be from overdoing it while exercising or playing sports. Joint pain can also mean something more serious like one of the aforementioned conditions, Lyme Disease, or, yes, Rheumatoid Arthritis. RA can hit anyone from infants to senior citizens. It is a no holds barred kind of condition that certainly does not discriminate. Osteoarthritis usually affects the older set, and athletes – it is considered a “wear and tear” condition. RA can attack the heart, eyes, skin, and other organs. It can affect the digestive system and can make patients susceptible to other illnesses and infections. OA gives a person pain, and may be a risk factor for osteoporosis, but it is not a systemic illness that can affect internal organs or cause other conditions. Both hurt. 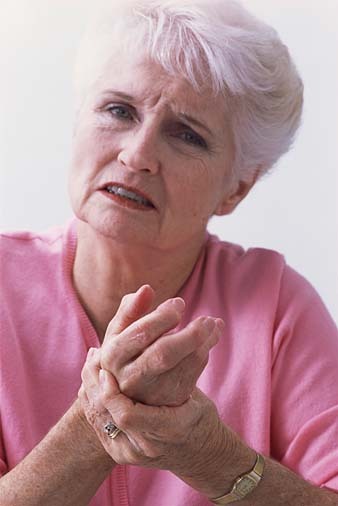 Most people with RA have OA as well, and so, they doubly hurt. Usually, NSAIDs, topical ointment, and pain medicine are used to treat OA. RA is treated by a whole slew of drugs including biologics and immunosuppressants. Both people with RA and OA are encouraged to exercise to help alleviate pain and keep joints mobile, but the types of exercises or ability levels may vary from patient to patient. RA is autoimmune in nature, OA is not. A group of people have petitioned to change the name of rheumatoid arthritis to better convey the potential severity of the illness. While that may work, it may lead to even MORE confusion. I’d hate to see arthritis awareness take a couple steps back due to the “naming situation.” And the truth is, no one can feel your pain or truly 100% understand until they are faced with the same condition or walk the proverbial mile in your shoes. While I hate the “arthritis” stereotype and do wish that people further understood the differences between the different types, I’m not sure that changing the name of any disease is going to actually better the cause. But, I don’t know, I’m on the fence. I’d love to hear YOUR thoughts & feedback! Let’s hear it! It is certainly an interesting and worthwhile debate. Tags: Arthritis, Arthritis Ashley, Arthritis Foundation, Ashley Boynes, Autoimmune, Chronic Illness, Disability, disease, fibro, fibromyalgia, Health, Human Body, illness, inflammation, inflammatory, joint pain, lupus, Lyme Disease, Mid Atlantic AF, Mid Atlantic Region, myositis, OA, ortho, osteo, Osteoarthritis, osteoporosis, pain, RA, Rheum, rheumatic disease, rheumatism, rheumatoid, Rheumatoid Arthritis, sjogren's, Spoonie, Spoonies, the name Rheumatoid Arthritis, Wellness, what's in a name. Bookmark the permalink. I’m not really sure about the “infants” but for teenagers, yes. I had OA as early as 18 years old. As a college student, I was very active in joining different events and practicing tennis. I was able to qualify for the tennis team but wasn’t able to play on the championship because of my joint pains. I still can remember the frustration and depression I felt that day. My parents helped me in seeking the appropriate solution for my arthritic knees and we have agreed for me to undergo stem cell treatment after several PT and chiropractic therapies. My Stem MD doctor, Dr Purita, introduced stem cell to us and what it can do to cure my knees’ joints. He evaluated my condition and scheduled me for 7-week therapy. I was able to get the beneficial effect of the therapy few weeks after I finished my last session. My knees went back to normal since then, no more pains, and uncomfortable feeling for me.